I tried to make a couple of bivy sacks but unfortunately starting a large project as your first MYOG project is not the best idea... So I decided to try and make a small crampon bag. On my Mt Whitney trip, I carried Crampons for the entire trip. I hated placing my crampons in my pack each time I used them because I was afraid their tips would puncture everything in my pack and they also would get everything wet. 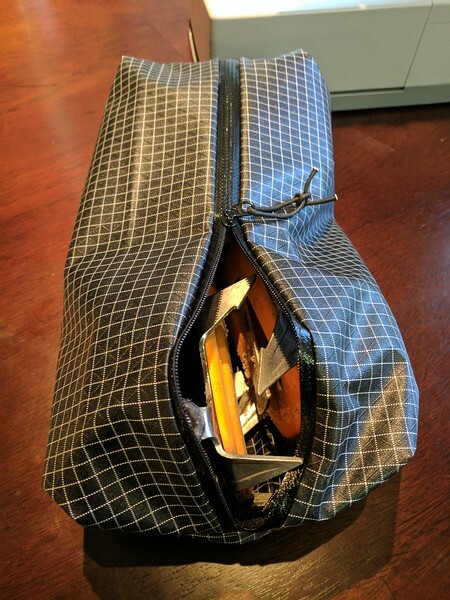 I had some Gridstop fabric laying around and a zipper that was going to be used to make a bag for my failed bivy sack. I decided to use that and create a bag for my crampons. 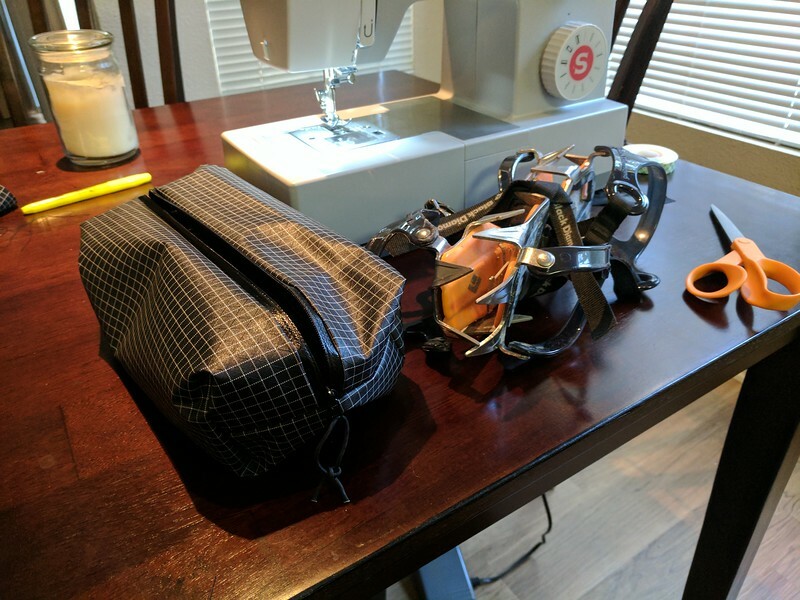 If you would like to create your own Crampon bag or just a bag in general with a zipper, I followed this tutorial. I don’t have the fancy heat cutter he used to cut his fabric but, I did just fine with scissors. I also chose only to use one zipper pull instead of two. 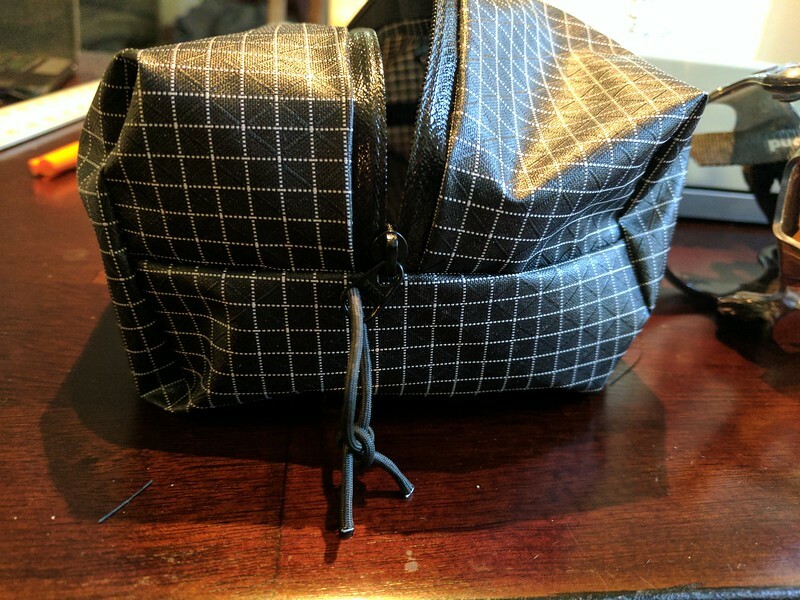 My finished product is by no means a perfectly sewn bag like the one in the video, I definitely rushed it a little and didn’t have pins or chalk, so I only did rough measurements with a ruler, and eyeballed a bunch. I honestly was very skeptical I was going to have a usable bag at all by the time I flipped it inside out, but I was pleasantly surprised. 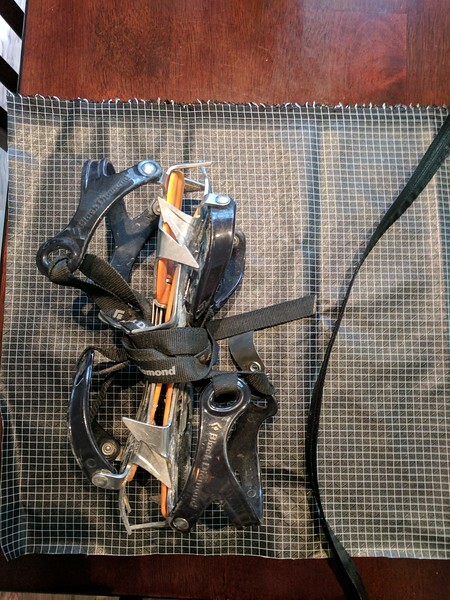 I was ecstatic my Crampons even fit inside the finished product! Cuben Fiber is slippery, and you definitely need to secure two pieces together between each other. Not sure if pins are the right answer for Cuben, but will try Cuben fiber double sided tape on my next project to help hold pieces together and help me sew straighter. Installing a zipper was not as difficult as I thought it would be. Next one of these I make will have a small handle at one end. I need more small projects before attempting my bivy sack again.